Since 2010, the country began to be realized federal target program "Development of transport system of Russia (2010-2015)". As part of this document is designed subprogram "inland waterway" in the performance of which is actively involved, "Yaroslavsky Shipbuilding Plant". The first order received of "YASZ" as part of the routine was the production of gates for the city of Uglich. For the first time the company has been manufactured metal structure with dimensions of 34 x 9 x 1.8 m, consisting of a panel weight of 160 tons and the two sectors weighing 11 tons each. 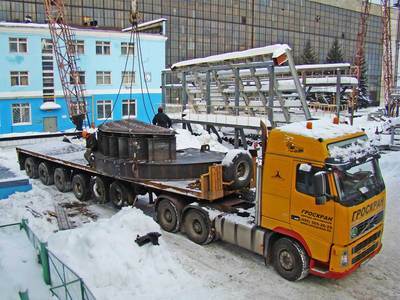 The gates were ottransportirovany customer and installed in Uglich hydroelectric installation. Primary metal of the second order (hydro Faustovo) for the modernization of the Moscow hydroelectric sent to the customer in January and February 8, the main mass of metal is scheduled for delivery to the customer before the end of February, after the installation of the customer inserts and supporting discs closures. The total weight of the order made by the second metal is 250 tons. At present JSC "YASZ" started production of steel structures for hydroelectric Severka. A waiting list of two agreements on hydroelectric Andreevka and Trudkomunna. The total weight of metal on these hydroelectric complex is approximately 800 tons.